Eva M. Sakmar-Sullivan has been an artist from the time of her early childhood. She made tablets from butcher paper and paper bags because she had a compulsion to draw and the tablets were too expensive. While in Junior High School, her parents enrolled her in the Art Instruction Schools’ correspondence course. But, the general thought in the 50’s and 60’s was that a woman could either be a teacher, secretary, nurse or homemaker. Eva chose to be a nurse, but when she almost fainted in a hospital during a family visitation, that choice was no longer an option. Eva was called to take her first” leap of faith,” a career in art -- her heart’s desire -- so she worked at winning every contest and scholarship she could and was able to attend and graduate from the Art Institute of Pittsburgh as a fashion illustrator. The day after graduation was her first day at work for a department store in her home town of Johnstown Pa. She went on to have a 15 year career in fashion illustration relocating to various cities including New York City in order to follow this dream. When fashion art was replaced with photography, Eva expanded her work to do comercial art and illustration for advertising agencies on a freelance basis. She also continued doing fine art and private commissions of human and animal portraiture. After a while, working on national accounts for advertising agencies and doing her portrait business was fun but became a lot of pressure. There was a longing that Eva began to feel. Right around that time, she was offered to have a one-woman art exhibition that required her to paint about forty new paintings. It was time for another “leap of faith.” Eva took a two-year sabbatical, lived off her savings and started to paint the kind of art that was hidden away in her heart. She always wanted to write and illustrate children’s books, paint fantasy and visionary art and just let loose of self-imposed restrictions. At the same time, she read an article about swimming with the dolphins. Up until then, dolphins were not something that interested her; but now, there was almost a “compulsion” to do it. She called the number, signed up for the trip and paid for it with a credit card. Then, reality set in. She abruptly remembered that she could not swim. She had a morbid fear of water and had almost drowned in the bathtub when she was young. The need to swim with the dolphins set her on the track to overcome this fear. So, she enrolled in a swimming class at the YMCA. Eva trained for several months. Unfortunately, even though she learned to swim, her fear took over and she was unable to get into the deep cold Florida water in January. She was filled with frustration and anger at herself because she kept thinking of the expense of the trip and all the snorkeling equipment she purchased. Eva decided to at least put her face in the water while she was on the floating platform. The group she was in was told that the dolphins would not come near the platform and that they needed to swim way out into the deep water to encounter them. However, miracles do happen. When Eva put her face in the water, she was overcome with emotion to see a dolphin staring up at her, eye to eye. The dolphin’s courage to come near the platform helped her to summon her own courage to finally get into the water and have a transformational experience with the dolphins. Eva has a beautiful daughter, Sierra who is an awesome spirit and also a patient model for her from the time she was a baby. Eva has been painting sacred visionary art ever since. 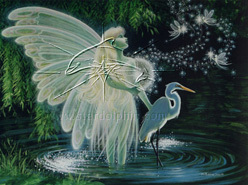 Her Spiritual path and love of nature fuels her desire to create works of art that inspire and uplift people of all ages. Eva has won many honors and awards and has exhibited on a National and International level. Her work is on book and magazine covers, tapes, CDs, posters and in private collections. She has written and illustrated several children’s books and presented them to local schools through her “Read and Draw with Me” program. To see examples of Eva's art that hve been published on some wonderful products, click here. 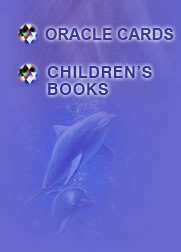 She now owns her own company, Dreams of Stardolphin. 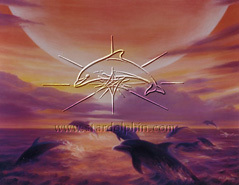 Stardolphin Greetings includes Eva's line of greeting cards, prints and magnets. 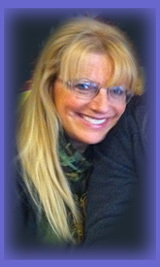 She sells them at expos, conferences and personal orders by phone (call 724-612-6114) or on this web site.